The question of Putin and Russian interest and involvement in the U.S. election debate, hacking of Democratic Party e-mails, and interference with US election voting all have been raised recently. They have also been mentioned by former Secretary Hillary Clinton. But more important are reports from U.S. intelligence sources that indeed Russians were involved in all of these activities. The significance of these activities has not been fully appreciated by the American public. The effort of Putin to impact and even change the trajectory of American democratic institutions in ways that will undermine our global leadership, respect and indeed security needs more understanding and attention. This is as serious an issue as any in this election. A main danger is what we still do not know of how much the Russians have influenced Trump and his staff. There are hints that Trump’s people had advance notice of the WikiLeaks documents which likely had their sources from Russian intelligence. We know that Donald Trump has praised Putin’s leadership, has said that Putin is a better leader than Obama And Trump has held a grudge against Obama and Clinton as has Putin. But of greatest importance so far is all the evidence indicates that Putin is more than hoping, but also acting on the theory of an American president who is clearly self-interested, ignorant of the niceties of global strategy and diplomacy, and has displayed total disdain for the importance of deep knowledge or listening to expert advice on critical issues in dealing with national security challenges. One of the deepest fears from the word of Trump has been his explicit indication that he would act as an authoritarian leader (“lock her up”) and disregard the norms and laws of our nation including ordering an investigation of Clinton which would be against all legal norms. This is not the only brutal authoritarian leader that Trump has admired and it seems that he thinks that as president these are good examples of himself as a “strong” leader. Trump, to make it clear, is and would be a danger to our national security at every level and proof of that alone is he admires a ruthless opponent and authoritarian leader that is trying his best to undermine the democratic West, their institutions and defense. As one will see an example from the voice of one of Putin’s supporters below, who clearly wants to help Trump to better manipulate the outcomes of American-Russian conflicts. Indeed it is my view we may more likely have a dangerous armed conflict with Russia under a maniacal Trump than from a highly experienced Clinton who knows the national security issues and risks and acts with real understanding and experience. The oddest recent development has been the dismaying statement by one of Putin’s colleague who leads a party that supports Putin, the Russian Liberal Democratic Party – a misnomer if there ever was one. 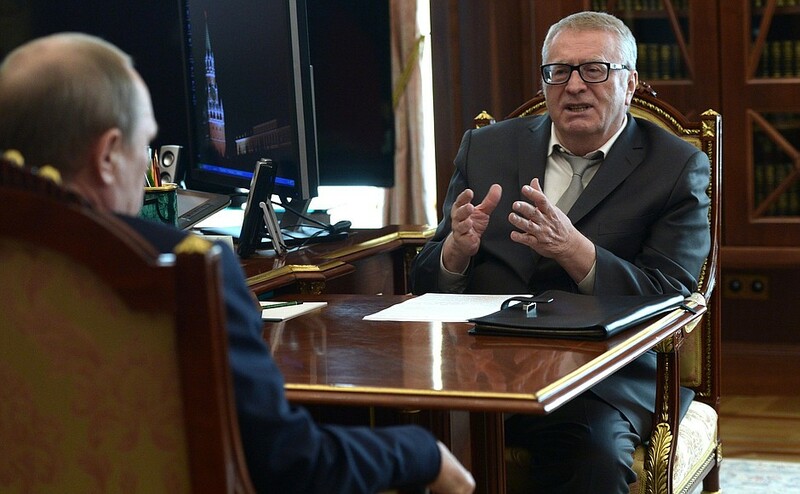 The man is Vladimir Zhirinovsky, an unrestrained veteran lawmaker known for his wild rhetoric, much in the mold of Trump, who told Reuters in a recent interview that Donald Trump was the only person able to deescalate dangerous tensions between Moscow and Washington. When you read Zhirinovksy think Putin for these are the words that Putin and or his people put into the mouth of one of his puppets to express their fear of a Hillary Clinton presidency and undermine her candidacy. In contrast, Zhirinovsky described Clinton as “an evil mother-in law” and said her record as secretary of state under Obama in 2009-2013 showed she was unfit to lead her country. ““Trump’s a colorful person. And well, isn’t he colorful? Colorful. I didn’t make any other kind of characterization about him. Russia media, via RT, also suggests that neither Trump nor Clinton would be Putin’s top choice. “As for Putin? He has said he’d like to work with a person who can make responsible decisions and implement agreements: “Their last name doesn’t matter.”” Putin has called Trump “colorful,” not “brilliant,” and has mentioned him only twice.